There is, clearly, no rest for the wicked! 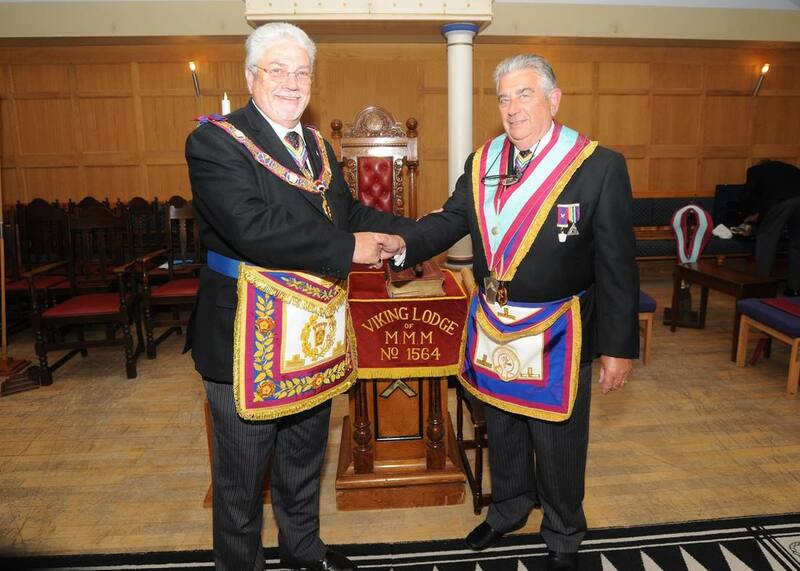 No sooner had the PGM appointed and invested his new Provincial Officers, than he was visiting Viking Mark, No. 1564 with them. The visit took place on Tuesday, 6th June at Saxon Hall, Southend on Sea where the team enjoyed both a RAM Elevation but an Installation in Mark. The RAM meeting saw the Elevation of Bro. Paul Field carried out in a most excellent manner by W. Bro. Bob Potts as well as a fine explanation of the nine steps by Bro. Paul Busby; all in all an excellent RAM meeting. After a short break, the Mark Lodge was opened, and the PGM along with over 20 Active Provincial Officers were received, in procession into the Lodge. As his his usual custom, the PGM took the Chair for a short while and, after a few opening remarks, was pleased to introduce each officer personally. He later informally addressed the Lodge taking the opportunity to update on a few matters of interest and importance to the Province. This being Richard Goodwin's Lodge, there were plenty of Charity Auction programmes for sale and not many escaped without having a fiver lifted from their pockets! The business of the Lodge was to Install a new Master. The Installing Master, W. Bro. Anthony Clark, performed that task with the utmost of confidence and precision with all aspects of the Ceremony being carried out to the satisfaction of all. All eventually retired to the festive board in friendship and conviviality (helped in part by the contents of the Viking Longboat!) where the PGM was pleased to inform his Lodge that, since the current Provincial DC was to be appointed as APGM, that the new Provincial Grand Director of Ceremonies would be W. Bro. John Finlay with W. Bro. Mick West crossing the floor to take the role of Deputy Provincial Grand Director of Ceremonies. All in all an excellent evening enjoyed by the new Active Officers as well as the Lodge. Officers and members of the Lodge with the PGM and Active Officers.